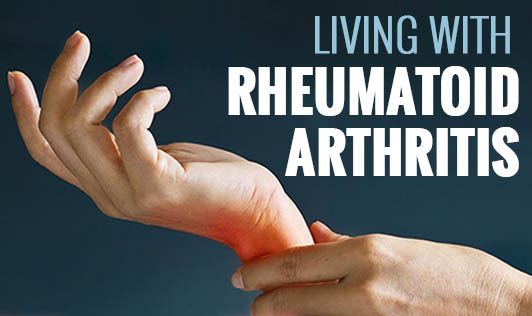 If you or a loved one has rheumatoid arthritis (RA), there are promising treatments that may add years to your life. However, there are also simple lifestyle changes that one can make which will improve health and increase his or her chances of living longer. People with RA are at a greater risk of other diseases such as stroke, heart attack and osteoporosis. • Exercise regularly as it reduces inflammation, improves heart health and can lower your risk for diabetes. • Get adequate amount of sleep, the hormones responsible for hunger and fullness can get out of balance if you don't get enough sleep causing you to eat more and gain weight. Furthermore, weight gain can make the pain and inflammation from RA worse. • Medications used to treat RA can affect your well being. It's important that you control the side effects, for instance if the medications can cause stomach upset and nausea, take them with food. Consult with your doctor before making these changes. • Use hot and cold treatments to soothe your joints and muscles, don't overdo it. • Take a shower to warm up your joints and stretch to help loosen you up for the rest of the day. • Manage your stress by mediating, deep breathing or by doing things you enjoy. Try the above tips to help you live a better life, everyday, with RA!